IntoUniversity provides local learning centres in disadvantaged areas where young people are inspired to achieve. The charity aims to address underachievement and social exclusion among young people by offering an integrated programme of out-of-school study, mentoring, aspirational coaching, personal support and, in partnership with schools and universities, a specially devised FOCUS programme. 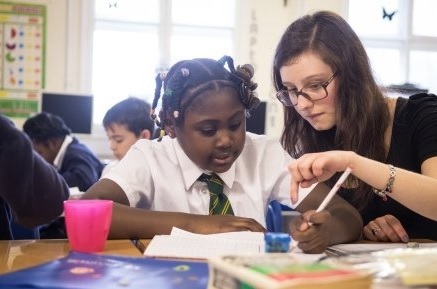 Mentoring: The IntoUniversity Mentoring Scheme matches a young person (aged 10-17) with a student volunteer, giving them the opportunity to receive tailored, one-to-one support for their academic attainment, social skills and future planning. Academic Support: Academic Support tutors will help primary and secondary students at after-school sessions at the IntoUniversity centre. Academic Support provides free tutoring and support to young people in a stimulating classroom environment. Young people receive tailored help with homework, coursework, revision and study skills. 1 hour per week for Mentoring and an hour and a half per week for Academic Support. Initial training is for a full day and covers all elements of the role as well as a general introduction to IntoUniversity. A reflection guide is used as well as regular one to ones and additional training as and when is necessary.